Although I saw far more trees in Arizona than expected (the mountains were covered in Ponderosa pines and Douglas firs), the two forests I explored with my camera had none. Petrified Forest National Park doesn’t look like a forest at all—though it was long ago. Today it is considered badlands and the only elements rising from this expansive landscape are buttes and mesas. And contrary to their name, the petrified trees scattered across the land aren’t even wood. They are three-dimensional fossils of trees that grew here in the Late Triassic Period, more than 225 million years ago. They formed as sediment filled the decaying cavities in ancient trees, most of which is now hard, dense quartz. And though these stone logs look as if they were neatly sawn into sections, they actually snapped under the pressure of the shifting earth that covered them. The Petrified Forest NP features a 28-mile road that runs from one end of the park to the other, with a short side loop through Blue Mesa (not to be missed). In addition to the petrified logs, the colorful rock formations in Blue Mesa and the Painted Desert (located in the northern end of the park) were wonderful. The park museum features replicas of early dinosaurs found in the area and you can tour the restored Painted Desert Inn and other historic sites. Saguaro National Park, Arizona. Photo ©2014 Lee Anne White. Next up were forests of cacti in the Saguaro National Parkand areas surrounding Phoenix and Tucson. Despite its very limited range, the Saguaro is perhaps the best known of all the cacti. The giant cactus, with “arms” that reach skyward as much as 50 feet, have become an iconic symbol of the American West, but you’ll only find them in certain regions of the Sonoran Desert. The average lifespan of a Saguaro is 125 to 150 years, though some live more than 200 years, and they don't begin producing “arms” until they are 50 to 70 years old. 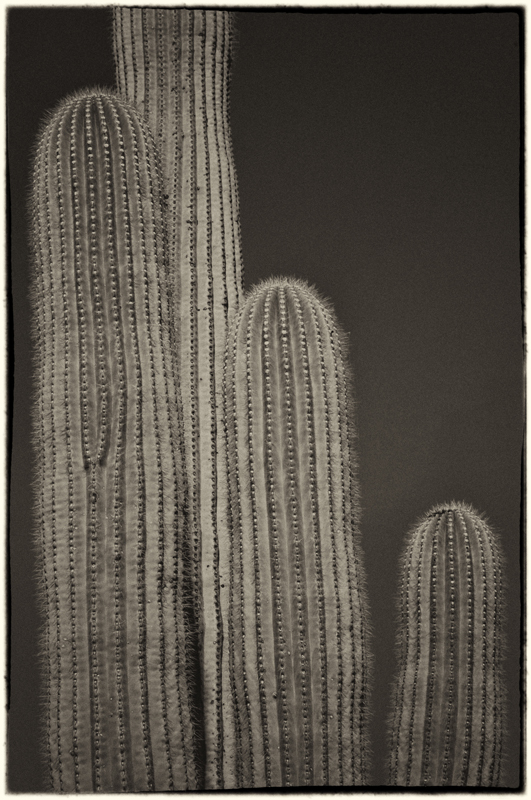 While the spines on a Saguaro may create “shade” for the cactus, they didn’t create much for me. On a hot Arizona day, I prefer the cool shade of soaring pines and firs. If you get to Saguaro National Park, be sure to stop by the Arizona-Sonora Desert Museum, which is a combination natural history museum, zoo and botanical garden focused on desert life. It is a unique museum in that it is located mostly outdoors and in the desert. It is almost hidden near the west park entrance, but it is truly a gem worth exploring. What are your favorite national parks? Did you know the National Park Service is celebrating itsCentennialthis year? 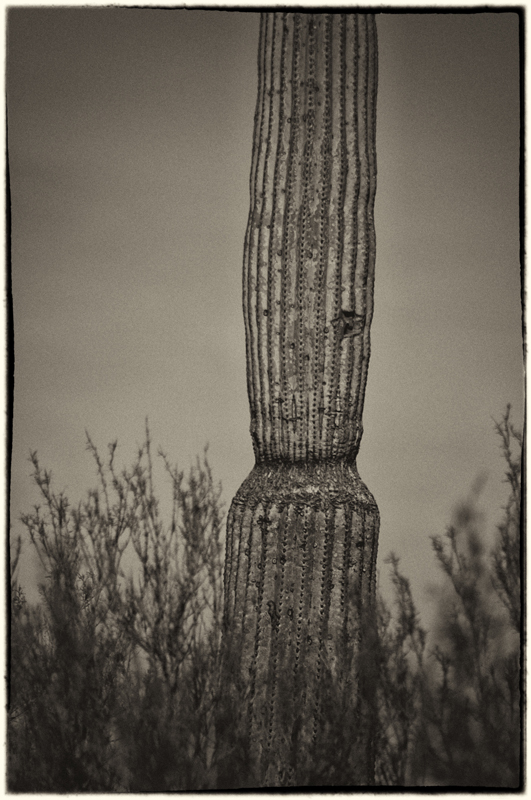 The saguaro cactus (Carnegiea gigantea), with its distinctive "arms," is perhaps the most recognizable of all cacti. Yet it is not a common cactus. It only grows in the Sonoran Desert in southern Arizona and western Sonora, Mexico, and one of the best places to see it is the Saguaro National Park, just west of Tucson. The saguaro is a long-lived and slow-growing cactus. It can reach 40-60 feet tall, but takes a long time to reach that height. A 10-year-old saguaro may only be 1.5 inches tall. Under the right conditions--the right mix of water and temperature--they can live up to 150 or 200 years. As they mature, they often (but not always) produce branches or "arms" that tend to reach upward. A fully hydrated, mature saguaro can weigh more than 3000 pounds and is covered with protective spines. Although they are considered trees, they are much more fun to photograph than to climb. One day, I'd like to return and photograph these giants at sunset.